Pro-Ject announces Juke Box S2 Stereo Set all-in-one turntable with speakers | What Hi-Fi? The £999 package promotes the all-inclusive concept of the brand’s cheaper Juke Box E.
We recently reviewed Pro-Ject’s Juke Box E, a £369 all-in-one turntable with amplification and Bluetooth built-in, and with the option to add speakers for an all-in price of £500. Pro-Ject’s reasoning for adding the Juke Box E to the heritage line was that Bluetooth was a desirable feature alongside vinyl for a modern record spinner. 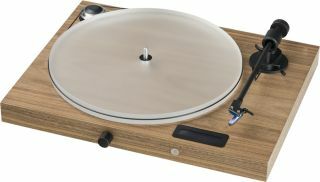 It also believes separate speakers are better than built-in speakers on turntables (due to vibrations on the tonearm) or active speakers (due to restricted cable length). The brand is now introducing a similar system at a higher price point, called the Juke Box S2 Stereo Set. The Juke Box S2 deck uses a ‘more sophisticated’ acrylic platter and an upgraded cartridge over the Juke Box E. It comes in two finishes, either walnut or eucalyptus. In addition to vinyl playback and Bluetooth streaming, you can also connect an external source to its analogue input and use the Juke Box S2 as an amplifier for your speakers. Inside the chassis is pre/power amplification, delivering 50W per channel. The belt-driven deck has a Pick-it 25A cartridge pre-mounted on a 8.6in aluminium tonearm, a manual speed change between 33 and 45rpm, and a display on top of the chassis. The Juke Box S2 Stereo Set system (including Speaker Box 5 S2 bookshelf speakers, isolation feet and cables) is priced £999, but the Juke Box S2 turntable can also be purchased separately for £699.